Look for one that is knowledgeable about his subject. You can ascertain this by looking at the contents of his website, his newsletters, his seminar information, and any information he provides to you. 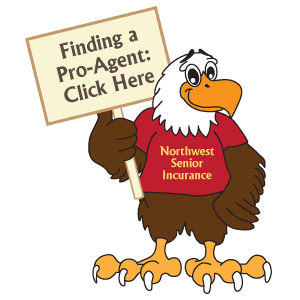 Choose an agent that works with a large number of Medicare supplement companies. Usually, the more the better. Look for an agent that is patient with you and is willing to take the time to explain things to you in an understandable manner. Look for the agent that is willing to put everything on the table, including any downsides to any plan that he is discussing. Go with an agent that you feel comfortable with and demonstrates ethics in his practice. Look for an agent that you perceive cares about you, your situation, and will be there year after year to continue to guide you through the Medicare maze. Look for the agent that makes it easy for you to get in contact with him. Go with an agent that gives you sound reason or basis for making a particular decision. As always, testimonials or references never hurt. Agents that disparage another company, especially by making any hint or innuendo that they may not pay their claims or will go out of business. Those agents don’t have that particular company in their briefcase, so they attempt to drive a wedge between you and that particular company. They suggest that you pay a higher premium for no reason at all other than for them to make the sale. Agents like these also tend to badmouth other agents. Agents that are single company agents or SCA’s. For more background, please refer to my online document, Dishonest Tricks of Unethical agents #6. There are exceptions, but usually it’s best to avoid agents in big box stores. Too many people have gotten bad advice or made hasty decisions only to regret it later. A good agent will offer to meet with you later in a quiet place. He will not be in a hurry! Agents that pander to you. Avoid property and casualty insurance agents. Their specialty is auto and home coverage, crop insurance, or commercial lines, but they do not specialize with Medicare products. They may carry a company or two, but usually that’s about it. Do you see your urologist when you have a heart problem? Probably not. Unless you want to pay more than you need to, don’t fall for their “let’s get it all under one roof” company line. When pressed, agents that can give no reason or basis for a particular recommendation other than to say, “I think it’s a good idea, or this is a good one”. The commission chasers. This is very common. Agents will pass up showing you a more competitive plan because it doesn’t pay as much commission compared to a more expensive one. Please refer to Dishonest Tricks of Unethical agents #1 and 2 for more information. Agents that appear to be uninformed, make off-the-wall statements, or make erroneous assertions. Likewise, be very wary of agents that make vague or unsubstantiated statements. In conclusion, finding a professional agent helps you to not only avoid Major Mistake #3, but also to avoid the first two Major Mistakes. Selecting a new policy or changing to a different one doesn’t have to be a scary process. A good agent will hold your hand and walk you through the entire process step by step. The result will be that you will have the confidence that you made the right decision and ended up with the right policy or plan. If you are replacing your existing Medicare supplement, you will have the peace of mind that your new plan is every bit as much as the one you have, but you will be paying less money. The third major mistake is shopping for a plan, when you should be shopping for an agent. There are some shoppers that have figured this out on their own and have intuitively avoided making these three mistakes. They know they are confused by the brochures that jam their mailboxes, so they toss them as fast as they arrive. They don’t want to talk to someone in Kalamazoo, so they seek to find an agent to help guide them through the Medicare maze. However, the majority of shoppers are still mistakenly shopping for a plan rather than a good agent. If you are approaching 65 and will soon be on Medicare, it is logical to think that you want some sort of a Medicare plan. You look at the brochures that arrive in your mailbox and maybe even call some of the 800 numbers. On more careful consideration, this is like getting the law books out when you have a legal matter instead of shopping for a good attorney. There are those shoppers that believe that if they go through enough agents, they will magically find the perfect plan. The irony about those types of folks is this: They are usually the ones that fall victim to the fast-talking, pandering agent. They often don’t recognize good advice when they hear it. 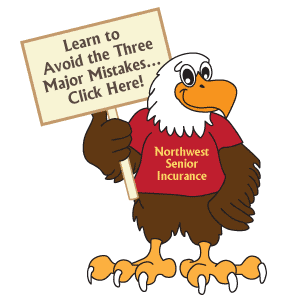 Finding a qualified insurance professional saves you much grief in another way. Countless Medicare supplement shoppers have gone to a friend, the senior center, the Council on Aging, calling 800 numbers, and who knows what else, only to get the wrong and often contradictory information. Working with a pro-agent from the get-go saves you all of that frustration. I was an educator for 22 years. From the standpoint of instructional technology, the way that this Medicare maze is being presented to Medicare recipients is worse than abysmal! In a classroom setting, good teaching technique says that the teacher should present one concept at a time to his or her students. When they master that step, the teacher presents the next step and so forth. For example, in teaching geography, the teacher will present the concept of “latitude” first to her students. When they have mastered that, she continues with “longitude”. Good teaching progresses one step at a time. Bad teaching throws multiple concepts into the very first lesson. Imagine trying to learn about latitude, longitude, parallels, meridians, date lines, equator, Tropic of Cancer, Capricorn, etc, etc, all at one time. It likely will turn into one big mish-mash, with the result that many students will be totally confused and passionately hate geography lessons. As your 65th birthday approaches, you will be inundated with a tidal wave of information. There are Medicare supplements, Medicare Advantage, Part D prescription plans, Medicare Advantage plans with built in Part D benefits, and a dizzying number of choices in each category to choose from. A good agent can explain each concept one at a time and help you understand which option best suits your needs. Going through that Stack of Stuff can or will put most people on mental overload! You don’t have to do it, as there is a much better way. Isn’t your objective to simply understand the Medicare maze so that you can make a smart decision that you are comfortable with? Assuming that’s a YES, here’s what to do. The majority of you are now hooked up to the internet and have email. Most all email servers have SPAM filters. You want to read the emails from your kids and grandkids and see their pictures and not waste time going through the SPAM. Just as email servers have their criteria for what emails get dumped into your SPAM Box, you do likewise with your Stack of Stuff. 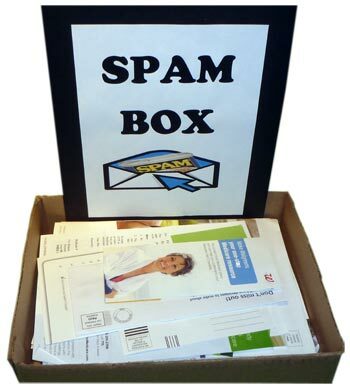 Once you have made your final selections and are happy with them, then you can empty your SPAM Box without any reservations. • Just about all company mailings. • Pieces from pharmacy chains. • Agent pieces that mention a particular insurance company or its rates. Note: As soon as that company goes up 15%, those agents are onboard with the next lowball company. • Seminar invitations if that is not your thing. • An agent mailer that appears to be poorly done. • An insurance company that has an affinity relationship with your fraternal order, union, club, religious group, or association. • Your “Medicare and You” booklet. 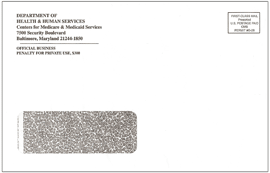 • The envelope from CMS that has your Medicare card and related information. Very helpful is the 31 page red, white, and blue Welcome to Medicare Booklet. It offers good, basic information to help you get started. Click image below to view. 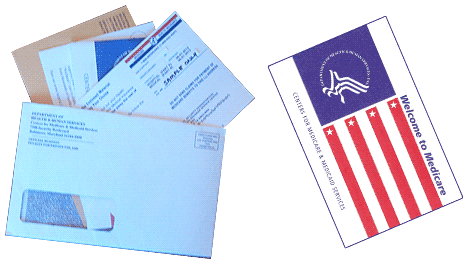 • Other mailings from CMS which might include a survey for Medicare recipients. • Any other piece with a government return address. It could be very important. • A quality postcard or other piece from an independent insurance professional if you are shopping for a good agent. • Seminar invitations, if that is your thing. Okay, so you’re now convinced that you should be shopping for an agent. Here is what to look for. The second major mistake is contacting numerous companies via their 800 numbers. Recently I spoke with a gentleman, Sam, who was looking for a Medicare supplement. He then mentioned that he was also interested in a Part D prescription plan. He told me that he had received a brochure from company Z and called them for information. I ran his meds on Medicare.gov, and sure enough, another company was a substantially better buy. The customer service rep (CSR) for Company Z could only promote her company and explain how their copays worked. As far as the rep goes in this situation, it’s like someone trying to sell you a shoe that doesn’t fit. If the shoe is too tight or hurts your foot, you know that right off the bat. In the case of a Part D prescription plan, you won’t know that until you run your meds on Medicare.gov. For Sam, calling the 800 number was a needless diversion and a waste of time. In another situation I met with Linda. She explained to me that because she was in a hurry, she had called an 800 number from a brochure she received in the mail to sign up for their Medicare supplement. Linda continued by telling me that one of the first questions the operator from Company Y asked her was, “Do you smoke?” She admitted to having an occasional smoke, so the rep signed her up for the tobacco rate Plan G.
Unwittingly, Linda had made at least three mistakes that I covered in the Ten Medicare Supplement Shopping Mistakes. She wasn’t taking advantage of open enrollment discounts for tobacco users, she called an 800 number, and she was going to pay a 25% higher premium than need be. And here is the saddest part. There are millions of Americans on fixed incomes and tight budgets. Many of them are making a financial sacrifice to purchase their Medicare supplement. Some have considered the usually lower premium Medicare advantage plans, but they are concerned about the various copays. This was the case in Linda’s situation. She wanted the peace of mind and financial protection that the Medicare supplement plan affords. So ask yourself, are the people on the other end of the 800 number really concerned about you and your budget, or are they just interested in selling you their company plan? As I sit down face to face with prospective clients, I well understand the pain and frustration that many of them are going through. There are times when I wish I could discount the premium, but regulations prohibit that. The least I can do for them is to show them how to navigate through the Medicare maze as affordably as possible. Folks, that doesn’t happen when you call the 800 numbers. There are other ways that a good agent can show people how to save money. For example, on several occasions I have shown people how to save four months of premium for their Part D prescription plans. For those taking no meds, they can wait until the seventh month of their Initial Enrollment Period (IEP) to sign up for their plan. That saves them four month’s premium or generally $60 to $120. The 800 number people are instructed to get you signed up as soon as possible. Here is another story of a bad experience caused by responding to a company mailer and calling their 800 number. I signed up Shirley for a Medicare supplement, and a few months later she mentioned to me the burial life insurance policies that she bought for both her and her husband. She described to me the very affordable premium and what she thought was a permanent policy. As soon as she mentioned the actual premium, I knew exactly what she had purchased. It sure wasn’t what she thought it was! I continued by telling her, “I want you to verify everything I’ve said. Call the insurance company tomorrow and ask them how it works.” Shirley did exactly as I suggested, and was not happy when the rep confirmed everything I outlined to her. She was disgusted by the misrepresentation and immediately cancelled both policies. Here is what happened in another situation. Becky received an elaborate brochure with an impressively embossed plastic wallet card attached. Her name was on it, of course, and the card read in shiny gold letters, “PREFERRED MEDICARE REVIEW. She called their 800 number and left a message. Within 30 seconds a call came back to her. In the end she signed up over the phone for a high-deductible Plan F. She paid 22% more than she needed to. This company is essentially a boiler room operation that uses “flim-flam” marketing. Their rep also led Becky to believe that their plan would have the same rate for four years. When I explained to Becky that no company has a four year rate lock, she said, “I’m going to call my agent.” Moral to this story: The more flim-flammy the marketing, the more flim-flammy are their reps. There are many, many more examples that I could cite. Calling a company’s 800 number can lead to costly mistakes. Even if an 800 number company is competitive, a good independent agent will most likely carry that company’s products anyway, so you don’t have to go the 800 number route. A related mistake that people make when calling a company’s 800 number, is thinking that somehow it will be a better deal (price) compared to working with an agent. Usually, the opposite is true. The Medicare supplement rates are all filed with your respective state insurance department. These rates are the same whether you buy your Medicare supplement direct from the company, an independent agent, or even Santa Claus. Even after hearing this, some people continue to ignore the facts and press onward in their blind ignorance and stupidity. When you buy via the 800 line, you are paying a commission to an agent that in the majority cases, you will never meet or speak with again. If you have a question, a problem, or a claims issue, most generally you will speak with a different rep every time you call that company. There are a myriad of other ways that a caring agent brings plenty of value to the table for the people he meets. For sure, one of the ways is advising them to avoid garbage financial products and insurance scams. This leads to the third major mistake. The first major mistake is reading endless company mailers and thinking that you need to digest and understand that Stack of Stuff. Those Americans that are approaching their 65th birthday are invariably on everyone’s mailing list, and they are being honored, or maybe inundated, with a flood of brochures from various insurance companies. 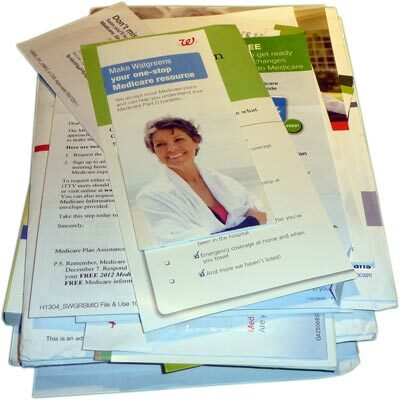 These brochures, of course, all pertain to some aspect of Medicare related products. These can include Medicare supplements, Medicare advantage plans, and Part D prescription plans; or seminar invitations for the same. Additionally, there may be other pieces from agents that send out blanket mailers, usually a card with a business reply address. If you are a member of an association or fraternal organization, you may receive mailings from their affinity partners. These are insurance companies that offer their members a Medicare supplement at a group rate. Lastly, some of the chain pharmacies distribute pieces pertaining to Part D Prescription plans (PDP’s). Most importantly, you are receiving communications from The Centers for Medicaid and Medicare Services, or CMS for short. 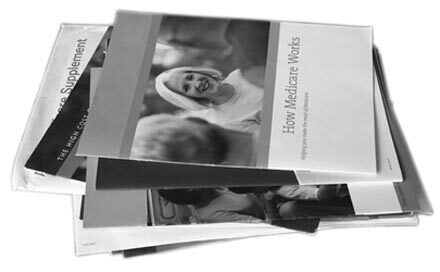 CMS sends you their 140 page publication titled Medicare and You. 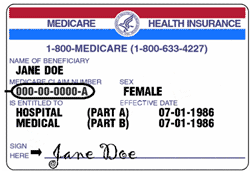 Your receipt of your Medicare card means that you are automatically signed up for both Medicare Part A and Part B. They both are usually effective on the first day of the month you turn 65. If your birthday is on the first of the month, then your Medicare effective date is usually one month earlier. As the brochures flow into your mailbox like a massive lava flow, do you want or need to take the time to go through that stuff? Does it help you, or does it actually leave you more confused? Here’s a collection from another household. Remember, there is nothing out there that suggests that you need to go through those stacks. The mistake is simply thinking that you need do so. Making this first mistake then opens the door for the second mistake.